Reps is a innovative pre-workout formula designed to increase performance and work capacity while in the gym, on the field and during periods of sporting competition. Rep's works on many different levels within the body, in order to improve work capacity and performance. 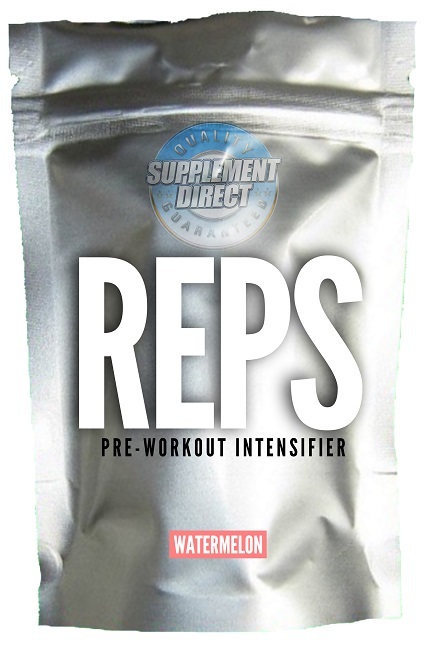 Rep's combines the following ingredients into a powerful and efficient pre-workout intensifier. Citric Acid, Maltodextrin, Calcium Phosphate, Artificial Flavor, Ascorbic Acid, Natural Flavor. Directions For Supplement Direct Reps: One scoop per 50lbs of body weight is recommendedand should be taken with 8-10 ounces of water 15-30 minuets prior to workout. REPS is a innovative pre-workout formula designed to increase performance and work capacity while in the gym, on the field and during periods of sporting competition. REPS works on many different levels within the body, in order to improve work capacity and performance. REPS combines the following ingredients into a powerful and efficient pre-workout intensifier. What the equation means is that hypertrophy or size is determined by the load or the amount of weight on the bar multiplied by the time under tension or the number of reps you do, followed by the volume or total number of sets you perform. REPS works by increasing your ability to make continual progress on each of the three pathways mentioned above which will allow you the ability to add more muscular size. Creatine Monohydrate works in a very powerful role. This helps to increase the muscle fuel called ATP or adenosine triphosphate. ATP is the primary energy-producing molecule for short bursts of energy or vigorous muscle contraction. Lifting heavy weights, sprinting for a short burst and any form of sparing all use ATP for the muscle’s primary energy source. Unfortunately, as you are exercising, ATP releases its energy at the time of contraction and it breaks apart, loses a phosphate atom, and forms adenosine diphosphate (ADP). The body only maintains a small supply of ATP which is sufficient to last a few seconds. This is why it is paramount to supplement with Creatine. In 1998, a study conducted showed that creatine can increase both strength and endurance in athletes. Creatine was given to 25 football players who had reached a plateau while undergoing a difficult weight-training program. After 28 days of supplementation with creatine, researchers measured a 41 percent increase in “total lifting volume” (sum of all lifts) (12). Have you ever reached a training plateau and wanted to break through it? Supplementation with Creatine could be part of the solution. Some researchers have shown strength gains with as little as five to seven days of creatine supplementation (14), (16). Creatine supplementation is also beneficial to older weightlifters and athletes. In a double blind study conducted at the University of Saskatchewan, they found that creatine supplementation in conjunction with a weight training program demonstrated a significant advantage in the creatine over placebo group. The creatine group increased their lean body mass, achieved a reduction in body fat, and an increased muscular strength, and endurance in men (6), (17). Overall creatine supplementation can enhanced muscular function and size along with cardiovascular and neurological functions (9), (15), (16). Beta-Alanine is the rate-limiting precursor of the amino acid Carnosine. What this means is that the more Beta-Alanine you ingest the more Carnosine your body can produce. Supplementation with Beta-Alanine has been shown to increase the concentration of Carnosine in muscles, decrease fatigue in athletes and increase total muscular work performed in one training session (7),(10). A recent study by Dr. Hoffman and Colleagues recently examined stacking Creatine and Beta-Alanine together and the results were simply amazing. The study used 33 highly trained college football players and monitored their results for 10 weeks. Prior to and following the 10-week study, the researchers had the football players keep a log of their dietary intake, measured the athletes' body composition, body weight, one-repetition maximum in the bench press and squat. The football players who consumed Creatine and Beta-Alanine increased their 1 repetition max on the bench by roughly 25 pounds. Increases in one-rep squat max were even greater, in that the increase in their 1 repetition maximum improved by nearly 50 pounds. The athletes also gained a significant amount of muscle mass and lost an average of 1.2% of body fat (11). Overall a very impressive study! Citrulline Malate is a combination of two non-essential amino acids that play a role in nitrogen balance and metabolic processes. Citrulline Malate improves aerobic performance and capacity by influencing lactic acid metabolism and reducing fatigue. Citrulline Malate helps to reduce lactic acid during intense training and sporting activities. Lactic acid is one of the compounds that are responsible for the intense burn that you feel towards the end of a set. For most individuals, if the intense burn is buffered, they can usually get another repetition or two which can lead to more muscle mass when compounded over hundreds of workouts during a year of training. Citrulline Malate also has the ability to increase plasma levels of Arginine within the body which can also lead to an increase in Nitric Oxide, “NO” levels (8), (13). Citrulline has also shown to increase ATP (Andenosine Triphosphate), which is the major source of energy during exercise along with greater phosphocreatine recovery after exercise. Another study involved 18 fatigued men that received oral supplementation of Citrulline Malate for 15 days. Measurements were taken using a magnetic resonance spectroscopy of the flexor digitorum superficialis muscle. The results showed that Citrulline Malate ingestion resulted in a significant reduction in the test subject’s sensation of fatigue as well as a 20% increase in the rate of phosphocreatine recovery after exercise and a 34% increase in the rate of oxidative ATP production during exercise (3). In another a double-blind randomized, placebo-controlled cross-over human study, researchers found that oral supplementation of Citrulline Malate resulted in increased renal uptake of bicarbonates which offer protective effects against acidosis and ammonia poisoning which help to explain the anti-fatigue properties of Citrulline Malate (4). Arginine Hcl is an advanced form of the amino acid Arginine used by bodybuilders and athletes to prolong the muscle pump, accelerate muscle growth, speed recovery and improve sexual performance. Arginine is suitable for bodybuilders, athletes and regular gym users wanting to gain muscle size and strength, get a better muscle "pump" while working out, and improve sexual vigor. Arginine works on many pathways within the body by stimulating the production of nitric oxide and insulin. Insulin is a very potent anabolic hormone, especially post workout. The anecdotal evidence reported from many satisfied gym users shows a clear increase in muscle pump, but what is more amazing is the possible strength increases associated with Argininee. Taurine is a conditionally essential amino acid and is the second most abundant amino in muscle tissue. Taurine has demonstrated muscle cell volumizing and insulin like effects, which can help to enhance protein synthesis and enhance glucose and amino acid metabolism. Taurine's powerful anti-catabolic effects have been well documented. Intense exercise and stress quickly deplete Taurine levels in the muscle. Therefore many researchers now believe that all high-intensity bodybuilders looking to maximize gains in strength and size should include Taurine in their daily supplement regimen. In one study a beverage containing Taurine, simple carbs and caffeine, just like in REPS increased endurance performance in a human trial (1). 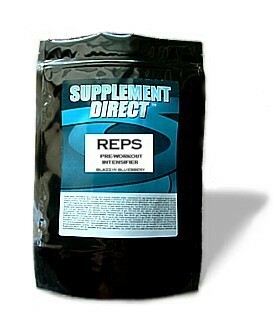 REPS also contains 6.5 grams of Dextrose for a 201 to 249 pound individual which will help in providing energy and keeping your blood sugar levels from dropping to low during physical exercise. Caffeine has been used for ages and helps to increase exercise performance, mental focus and provide a short term reduction of fatigue. One study looked at caffeine and its direct effect on the central nervous system and strength gains. In this recent study, 37 men were divided into a caffeine or placebo group. The caffeine group received a supplement that contained approximately 200mg of caffeine which seems to be a near perfect amount of caffeine for most individuals. One hour after ingestion of the supplement, each individual was tested for their 1 repetition maximum on the bench press and their total repetitions. The caffeine group demonstrated an increase in maximal bench press strength compared to the placebo group. The group receiving the caffeine also performed more repetitions using a sub-maximal load. This study shows that when 200mg of caffeine is ingested prior to exercise, performance measured in strength and total lifting capacity are improved (2). What will I notice when taking REPS? You'll notice that you're able to train harder in the gym and play harder on the field. In the gym you will have the ability to get more reps with the same weight, add more sets, and experience less fatigue and lactic acid build up. You'll be able to train at a much higher intensity level. This will help lead to more muscle mass, increased strength, and less body fat with a proper training program that includes optimal recovery. What's the best way to take REPS? For maximal results, take one serving 15-30 minutes prior to workout or sporting competition with 8-10 ounces of water. If you are training twice a day or lifting weights in the AM and training for your sport during the PM you can take a second serving before each event. Could REPS be banned by an athletic organization? It's likely that most high school, college and professional organizations that have stringent supplement policies in place would not allow this product. It is recommended that you check with your federation or responsible governing body regarding the use of this product prior to purchasing and incorporating into your performance enhancement nutritional regiment to be safe. How long does it take REPS to work? Research suggests that maximal increases in performance will happen within 4 weeks for the majority of the ingredients. However, most athletes experience noticeable effects within the first 30 minutes of drinking. What will REPS do for bodybuilders and weight trainers? Bodybuilders will be able to train with a higher volume of work. Delaying fatigue with REPS is accomplished through the synergistic properties in the formula. They will essentially help you rep out more during each set or allow you to add more sets to your current program. The greater the training volume and intensity, “measured in percentage of 1RM” the greater the increase in muscle size you can experience. I want to stack REPS with additional products. What should it be? You could stack Supplement Direct’s Micronized Creatine Monohydrate, at a dosage of 15 grams for the first 4 days if you want to include a loading phase for the creatine. This would increase your water retention in a faster period of time, but it is not truly needed as your system will be saturated with creatine at week 4 if you take the supplement as prescribed. Some individuals might also like to take an additional serving of Supplement Direct’s AAKG upon waking up or before going out on a date in order to have the appearance of a fuller look. For an even greater increase in ATP replenishment, individuals could add an additional 3-9 grams of Ribose depending on their weight. Is there any need to cycle REPS? At this current time there is no profound literature supporting the fact that any of the ingredients in REPS needs to be cycled. However, many individuals do like to cycle their supplements for various personal reasons. What are the possible side effects of REPS? Supplementation with Beta-Alanine and Citrulline Malate in high doses can sometimes cause a harmless flushing or tingling effect on the skin. If this bothers you, you can reduce the dosage or split it up in two servings, ½ of a serving 30 minutes prior to your workout and ½ of a serving during your workout. (1). Amino Acids. 2001;20(1):75-82. The influence of a taurine containing drink on cardiac parameters before and after exercise measured by echocardiography. Baum M, Weiss M.
(2). Beck TW, Housh TJ, Schmidt RJ, Johnson GO, Housh DJ, Coburn JW, Malek MH. The acute effects of a caffeine-containing supplement on strength, muscular endurance, and anaerobic capabilities. J Strength Cond Res. 2006 Aug;20(3):506-10. (3). Bendahan D, Mattei JP, Ghattas B, Confort-Gouny S, Le Guern ME, Cozzone PJ. Br J Sports Med. 2002 Aug;36(4):282-9. Citrulline/malate promotes aerobic energy production in human exercising muscle. (4). Callis A, Magnan de Bornier B, Serrano JJ, et al. 1991.Activity of citrulline malate on acid-base balance and blood ammonia and amino acid levels. Study in the animal and in man. Arzneimittelforschung; 41(6):660-3. (9). Gordon A, et al. Creatine supplementation in chronic heart failure increases skeletal muscle creatine phosphate and muscle performance. Cardiovascular Research, 1995. Vol. 30:3,413-418. (10). Hill CA, Harris RC, Kim HJ, Harris BD, Sale C, Boobis LH, Kim CK, Wise JA. (2007). "Influence of beta-alanine supplementation on skeletal muscle carnosine concentrations and high intensity cycling capacity". Amino Acids 32 (2): 225-33. PMID 16868650. (11). Hoffman et al. Effect of creatine and beta-alanine supplementation on performance and endocrine responses in strength/power athletes. Int J Sport Nutr Exerc Metab. 2006 Aug;16(4):430-46. (12). Kreider, R.B., Ferreira, M., Wilsoln, M., et al. Effects of creatine supplementation on body composition, strength, and sprint performance. Med Sci Sports Exerc, 1998, 30: 73-82. (14). Urbanski, R.L., Vincent, W.J., Yuaspelkis, B.B. Creatine supplementation differentially affects maximal isometric strength and time to fatigue in large and small muscle groups. Int J Sport Nutr, 1999, 9: 136-145. (15). Vandenberghe, K., Goris, M., Van Hecke, P, et al. Long-term creatine intake is beneficial to muscle performance during resistance training. J Appl Physiol, 1997, 83: 2055-2063. (16). Volek, J.S., Kraemer, W.J., Bush, J.A., et al. Creatine supplementation enhances muscular performance during high intensity resistance exercise. J Am Diet Assoc, 1997, 97: 765-770. (17). Tarnopolsky, M.A. Potential benefits of creatine monohydrate supplementation in the elderly. Curr Opin Clin Nutr Metab Care, 2000, 3: 6, 495-502.